And it was an old audience who attended the inaugural program of the Palm Beach Chamber Music Festival’s 27th season. When clarinetist and founding member Michael Forte welcomed those in attendance, he mentioned that many had been PBCMF regulars for much of its history, and some indeed had attended all 27. There was certain poignancy in that remark inasmuch as it was clear that some of them would not be there for many more. The Allegros were played at a comfortable jog trot and the rhythmic character ensured good ensemble in those movements. Not so much in the Largo, which revealed weakness in both cantabile playing and ensemble. Flute sonority is the dominant feature of the work, and Karen Fuller and Beth Larsen played their parts well, as did violinist Mei-Mei Luo. A trio d’anche (reed trio), was heard next. Forte introduced Rustiques, a 1946 work by the folksong collector and composer Joseph Canteloube (1879-1957), whose name is known for his Songs of the Auvergne, a cycle of Languedoc folk songs. Joining Forte were oboist Erika Yamada and bassoonist Michael Ellert. The work’s three movements consist of blended French folksong settings. The trio d’anche was a genre particularly favored by French composers of the last century; thus the repertoire contains many distinguished items. Canteloube’s handling of the woodwind textures did not seem especially adroit, but was sometimes thick and not as nimble or transparent as usually encountered in these works. Perhaps more rehearsal would have improved things. In the slow second movement (Reverie), Ellert’s intonation often strayed slightly from true pitch and then recovered, producing a feeling of uncertainty. Fuller and Larsen were joined by pianist Milana Strezeva for the empty but highly entertaining hijinks of a Paraphrase en souvenir de Adelina Patti by Albert Franz Doppler (1821-1883), an arrangement of music from Bellini’s opera La Sonnambula. A flute virtuoso, he toured throughout 19th-century Europe with his younger brother, Karl, and they performed mostly original works intended for their own use. This one dates from 1886 and bears a dedication to Patti, the leading diva of the time in coloratura soprano roles. Those are the most recognizable portions amid a torrent of passage playing and bravura duetting. All great fun, ably played by the flutists supported by Strezeva. After intermission, Mendelssohn’s Trio in C minor (Op. 66), written in 1845. Although less well-known than his earlier D minor Trio of 1839, the later work is usually thought to be superior in invention. The performers, pianist Milana Strezeva, violinist and founding member Dina Kostic, and cellist and founding member Susan Bergeron, were most persuasive in the opening Allegro energico e fuoco, in which they achieved an excellent balance between the music’s lyric warmth and early romantic turbulence. In the succeeding Andante espressivo, a mixture of siciliana and barcarolle, its opening measures were played rather squarely by the pianist; however, when the strings entered they restored its proper shape, and all ensured that the material was never sentimentalized. The Molto allegro is a classic Mendelssohnian scherzo, gossamer and playful. The strings didn’t articulate their material as crisply as desired, so textures tended to blur where they should have been crystalline. The finale is notable for the composer’s quotation of the psalm “Herr Gott, dich loben alle wir,” known in English as “Praise God from Whom all blessings flow.” It would doubtless have pleased Mendelssohn’s many English admirers. More rehearsal would have improved the performance, which contained more inaccurate pitches and signs of fatigue that one should hear in a finale. Thank you for taking the time to write a review of our concert, Dennis! I do need to correct you about what you assumed was my ignorance of Adelina Patti’s predecessors, however. 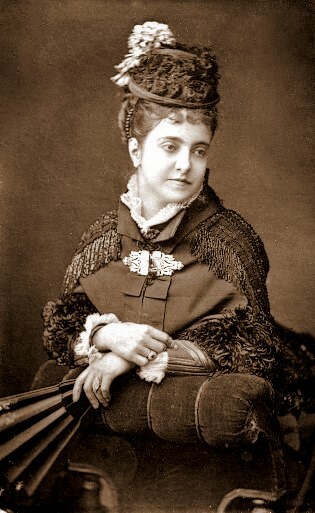 I am very aware that she was not the world’s first Amina (and I’m sure I never claimed that), but she is the soprano for whom Doppler wrote his piece. Obviously I could have gone into much more depth about the history of Bellini’s La Sonnambula, however I chose to focus on the piece we were performing. You might reconsider making such assumptions in print in the future.